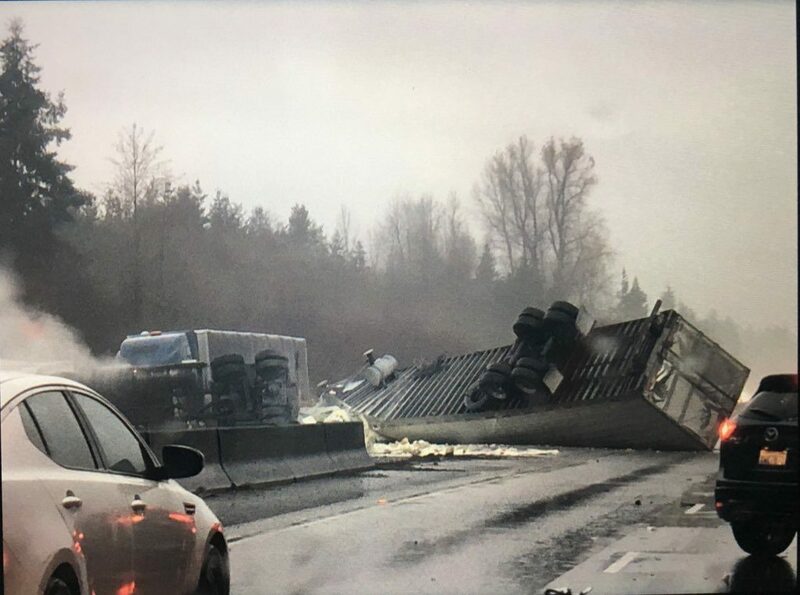 For several hours yesterday, a rollover truck crash on I-5 resulted in the closure of all the southbound lanes, and part of the northbound lanes. The crash occurred between Tumwater and Maytown near 113th Avenue, but affected drivers from Portland to Seattle. 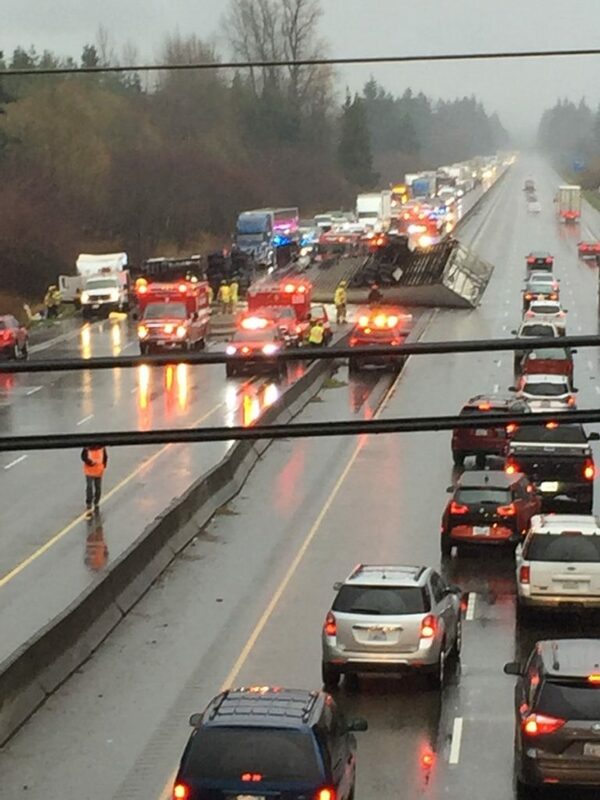 The Thurston County Sheriff reported that a second crash – a hit-and-run on I-5 northbound – also contributed to the traffic disaster. I5 southbound near 113th Avenue SW, shortly after a semi truck crash. Photo from the Thurston County Sheriff department, via Twitter, which also mentioned a second crash. 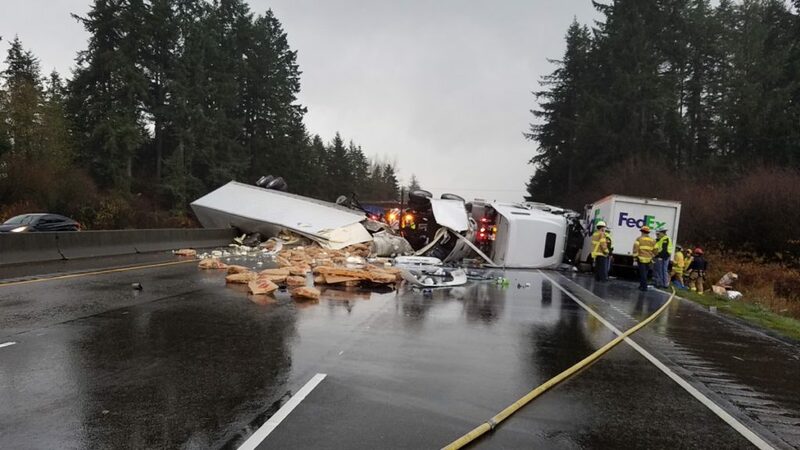 Preliminary information from Washington State Patrol indicated that a passenger truck driver heading north on I-5 lost control of their vehicle. A state trooper said the passenger truck was travelling too fast for the wet conditions, and the driver lost control. The vehicle started to spin out, and an approaching semi-truck swerved to avoid it. The semi driver then lost control of their tractor-trailer. The rig plowed through the center concrete barrier into southbound I-5, where it hit a FedEx truck. The semi-truck overturned, spilling part of its cargo of bags of powdered milk. The semi-truck struck the concrete barrier, and rolled over into I-5 south, hitting a Fed-Ex delivery truck. Photo: WSDOT Tacoma, via Twitter. It took road crews several hours to clean up the roadway after the rollover truck crash. First, they had to remove the destroyed semi-truck. The powdered milk and truck debris had to be removed with heavy equipment. Then, they had to replace the damaged concrete barrier separating the north and southbound lanes of I-5. One lane of southbound I-5 was eventually opened to traffic several hours after the crash. 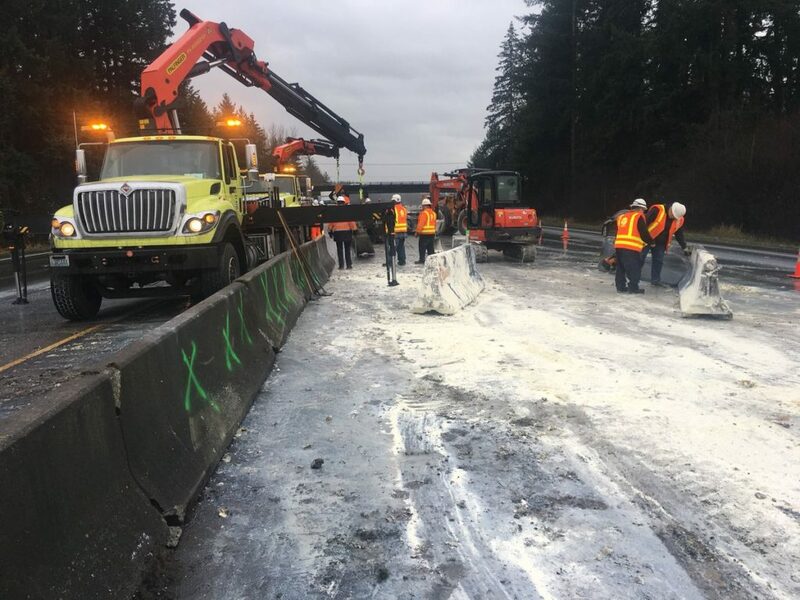 All lanes of I-5 were reopened around 4 p.m.
Crews were cleaning up powdered milk debris and repairing the I-5 lane barrier for many hours after the truck crash. Photo from WSP Trooper Batiste, via Twitter. Could this truck crash rollover have been avoided? Based on the information we have so far, it sounds like the events were started by a driver who was speeding and lost control. But commercial truck drivers learn defensive driving, and how to avoid collisions. In this instance, it appears that the semi-truck driver avoided a collision with the passenger vehicle, but in doing so, caused the tractor-trailer to turn over. The concerning thing about the way this incident occurred is how the tractor-trailer crashed into oncoming traffic. Commercial truck drivers are trained to never swerve into oncoming traffic. And, the driver should have known that a heavy trailer was at risk of rolling over at highway speeds. The truck driver’s failure to account for the trailer’s weight might have contributed to the rollover. The speed of the semi-truck was likely an additional factor, as it appears to have been in the left or possibly center lane. Properly trained semi-truck drivers are taught to allow an appropriate “space cushion” for a situation that may occur, such as happened here. They are also taught to make sure that have sufficient braking distance to avoid being involved in a crash. I have recently handled two similar cases wherein semi-truck drivers did not anticipate likely hazards and did not properly consider the weather conditions and how those conditions affected braking distances and crash avoidance. It’s the season for winter weather crashes, and Washington is not off to a good start. State troopers reported multiple serious crashes so far, some with fatalities.